When I decided on doing a partial renovation on our home, I wanted to give it a totally different look without doing too much work and costs, so I chose to install beadboard paneling. Beadboards are convenient because they do not need to much adjustment to make them fit on the walls, and when I finished installing and finishing the last piece, the entire look of our house completely changed. If you are interested in using beadboard panels in your own home, but still not completely convinced that they are the right choice for you, then allow me to persuade you into using these neat decorative accents. Beadboard panels got really popular back in the 1800’s; back then, beadboards were made of individual strips of wood leftover from making the floors of the house. It got the name “beadboard” because of the grooves, or beads” that run vertically up the panel where the wooden planks are interconnected. 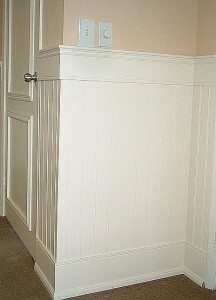 These days, beadboards come in four by eight feet boards that already have the beading carved on them. Modern beadboards are easier and faster to install than the old tongue and groove planks that were used in the old days, and they are more cost effective as well. As I previously mentioned, beadboards are easy to install, and you only need a couple of simple tools to do the job. Me and my spouse actually did the installation of the beadboards ourselves, and it only took us the weekend to finish our kitchen, our target for next weekend is we will be installing a beadboard wainscoting on the walls along the hallway. 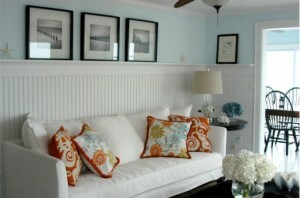 Even though I say that it is relatively easy to install beadboards, it is not something that you can learn on the fly. You should try to look for tutorials and instructions on how to install beadboard wainscoting properly; once you get the basic idea on what to do, you will be amazed at how fast your work will progress. If you take a look at old pictures of houses, beadboards are traditionally painted picket fence white, and though this is a classic look that will never go out style, it can be quite boring to always see a white backdrop in every room of the house. I do not like my home to be boring, I want it to become interesting, so I decided that we should just stain the wood on the wainscoting to match our oak cabinets and also because it offers a great contrast to the dark green wall paint we already have. Here’s a reminder when painting or staining beadboard panels; because they are made from a softwood like pine, beadboards will contract and expand depending on the temperature, so you better paint them before you place the top and bottom trim. I hope that this article was enough to make you at least consider the use of beadboard paneling in your home; they not only look great, they are also easy to install and cost-effective.